Fashion Law is of course a favorite around here. As the niche grows and gets its due notoriety we are always delighted to share what's happening in and around the field. This is SO major, and we are SO excited. Fashion law is not only making waves across the country, but is etching it's stiletto print in the City of Chicago. I am honored to be a panelist and can't contain how honored and ecstatic I am. 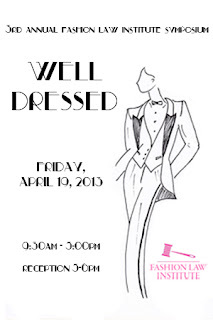 The John Marshall Law School Fashion Law Society is pleased to present The First Annual John Marshall Law School Fashion and Design Law Symposium. 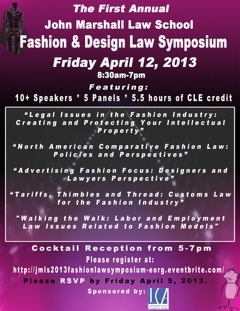 The Symposium will consist of panel discussions on the latest groundbreaking legal issues concerning the fashion industry. There will also be an opportunity for you to network and mingle with individuals from all facets of the fashion and legal industries. We must always pay hommage and gratitude to Ms. Susan Scafidi. She's the First Lady of Fashion Law and has not only led the niche on Capitol Hill, but chartered the 1st Fashion Law Institute at Fordham School of Law. The Fashion Law Institute is hosting their 3rd Annual Fashion Law Symposium. Can't wait! The fast fashion giant tried it again. 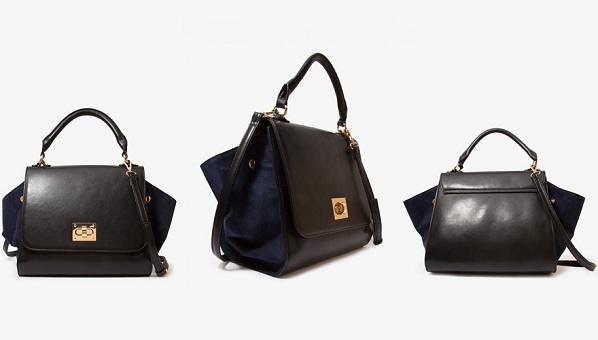 Forever 21 offered a dead ringer for the couture Celine "Trapeze" bag. Needless to say, Celine is more vigilant than Forever 21 took them to be. Bags have since been removed from the racks. For years now, you've been able to point your smart phone at a radio and find out what song is playing. Now, you will be able to do the same with fashion items. Shazam is expanding into the fashion world, developing an app to let people see, click, and search their way to chic. Where has this been all my life!? Spain's fast fashion giant, Zara, is in hot water over slave labor accusations at their Argentinian warehouse. Apparently, the production facility was doubling as a home to some of its men, women, and child laborers. Local labor groups said the facility was poorly lit, unsanitary, and kept workers on the clock for 16 hour shifts with no break. No outfit is that serious. This is the 2nd time in less than 2 years. Stop it. 6. YSL not only came out unscathed in the red bottom case, but is now getting 2 biopics! 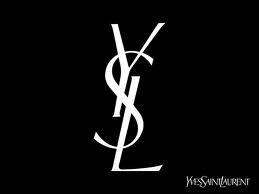 High fashion designer Yves Saint Laurent will never be forgotten. The trademark style and haute fashions will remain staples forever--and 2 movie producers will make sure of it. Although only 1 has the blessing of Pierre Berge, his YSL's former partner, there's plenty of IP issues to be sorted out and enough right of publicity concerns for both to potentially get attention. Case Clothesed did a great piece on this one. What are the right of publicity laws in your state? As we've noted here before, there's a difference between counterfeits and knockoffs. Counterfeits are attempts to pass off a fake product as the real thing, while knockoffs are when Coach's signature "C" turns into a "G". Knockoffs are plays on the real thing. We all know better, even the producer, but they sell it anyway. Well, Canada is having no parts of the counterfeits. Counterfeits are offensive to hardworking designers and give consumers a jaded view on brand sourcing if they aren't careful. C-56 amends the Copyright Act and the Trade-marks Act to strengthen the enforcement of copyright and trade mark rights and to curb commercial activity surrounding infringing copies and counterfeit products. It also helps Canada uphold their requirement in the Anti-Counterfeiting Trade Agreement (ACTA) and will allow Canada to ratify the Agreement. One small step for fashion law. One giant step for fighting fakes! 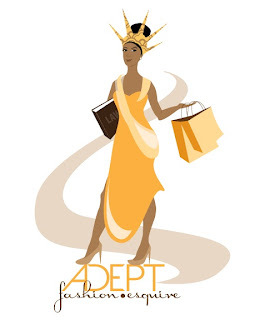 To feed your Fashion Law Addiction, here's more on the niche. We were equally excited to have you as a panelist! Thanks for visiting the John Marshall Law School! It was great meeting you today and listening to you. It was my pleasure and honor. Thanks for having me!